“These are the wretches who announce officially and spread rumours that the Bolsheviks are invading our territory in bands and that the national movement is in reality a Bolshevik movement. These are the misguided persons who officially and openly publish to the world through the mouths of foreign journalists that our noble national movement is nothing but a desperate enterprise of the Unionists and that it is supported by their money. “And these are the badly-informed men who officially spread the news through the various agencies that Anatolia is a theatre of unrest, and who, referring to the special stipulations of the armistice, try to surrender our beloved country to occupation by our enemies. “And finally, these are the depraved creatures who intend to incite the Mohamedan population of Malatia and Sivas to butcher one another. “These are the traitors who, so that they would be able to stop the national movement, would like to see Sivas and all the other places where the awakening of the national feeling is developing occupied by foreigners. “But, notwithstanding this, it is our most sacred duty (as you, my brother, also suggest) to annihilate the calumnies which evil-tongued people are spreading abroad throughout our beautiful country, as well as the criminal machinations in which they are publicly engaged; to condemn them to impotence in their hidden lurking places, and bring the actions of the Government, in their effort to save the country, into accord with the aims of the nation. “Thank God that our nation, on its road to its goal, has over come all the attempts of the malicious people, whoever they may have been, and has begun resolutely to move forward with renewed courage. 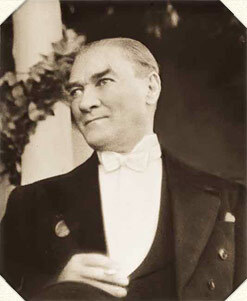 “As for the foreigners, they understand how great the strength of the nation really is and how fixed its purposes are. ^They recognise how powerless the Government is in comparison ; it is without character and entirely out of touch with the people. They have evacuated Mersiwan and have also begun to evacuate Samsoon. They declare that they axe neutral in regard to the national movement, and have declined to interfere in our internal affairs. This is the first result attained by our national movement, which is striving for our in dependence.